Manama, Feb.5 (Petra) -- His Royal Highness Crown Prince Al Hussein bin Abdullah II met with King Hamad bin Isa Al Khalifa of Bahrain in Manama. At the meeting attended by Crown Prince Salman bin Hamad bin Isa Al Khalifa, who is also deputy supreme commander and first deputy prime minister of Bahrain Crown Prince Al Hussein conveyed His Majesty King Abdullah's greetings to King Hamad and the people of Bahrain. King Hamad asked His Royal Highness to convey his greetings to King Abdullah and to the people of Jordan. 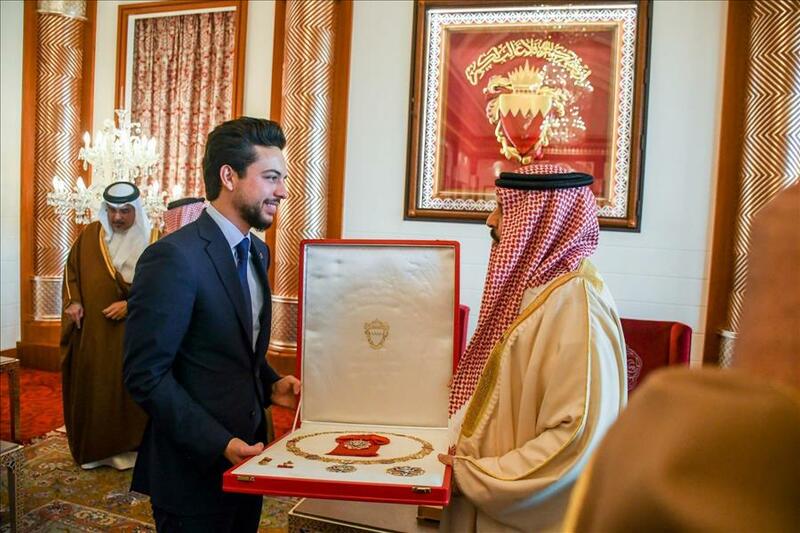 The Bahraini monarch also bestowed the King Hamad Order of the Renaissance 1st class (Wisam al Nahda) on the Crown Prince, in appreciation for his efforts to bolster Jordanian-Bahraini relations. Discussions at the meeting, held at Al Safriya Palace, covered the strong ties between the two countries and keenness to advance them further, while maintaining coordination on issues of mutual concern. King Hamad commended King Abdullah's efforts to strengthen Jordanian-Bahraini ties, lauding His Majesty's steadfast positions in defence of Arab causes and in support of joint Arab action. The Bahraini monarch also expressed appreciation for the Jordan Armed Forces-Arab Army's contributions in support of the Bahrain Defence Force. His Royal Highness congratulated King Hamad on the 51st anniversary of the establishment of the Bahrain Defence Force. Moreover, King Hamad affirmed the importance of the Crown Prince's visit in expanding opportunities of cooperation.